Was the advanced item collector disabled in this pack or the by the mod author himself. Have been searching everywhere and can't seem to find the answer. Thanks. I had an issue it happen every time i cross the Nether Portal then i can't move anyway, also the chunk i stand(From Overworld to Nether) and my island(From Nether to Overworld) can't load. I played in singleplayer gamemode. Could anyone help me how to fix this bug. i had an issue because I broke a dislocator, but I managed I fix it with commands and a lot of back and forth. My user error aside, I really am enjoying the theme of the map and the fact that different ships lead to sky islands with differing biomes. Can I run my own server with this? 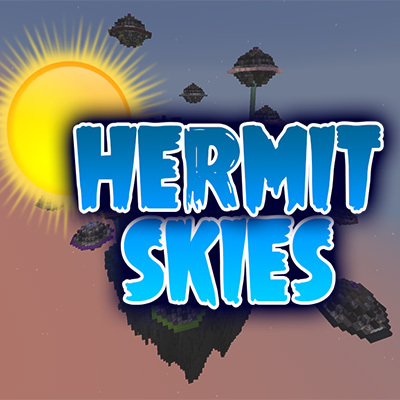 I'm very new at this and my friends and I would like to run the Project Ozone Lite with the Hermit Skies world. Just trying to figure out if I can run it as a server on a dedicated PC at my home, not just open to LAN. If u want to install it i recomend you use the Twitch launcher. next to the Twitch logo -> mods -> Project Ozone LITE -> RIGHT click open folder -> saves -> and copy and paste it in there. go then in-game (Project Ozone LITE) en go in that save you'll should see it in the singleplayer tab. If you're playing in single player, you might not have "cheats" allowed. To allow them, pause the game and select the option "Open to LAN". In this menu, select he option that says "Allow Cheats". This will only last until you close the LAN server. If you're playing on a server, you might not have the privilege to use commands. If this is the case, you will need to talk to the server owners about their rules. FIXED: It doesn't specify on this page that HermitSkies is a *world* that needs to be uploaded/added to your already existing POL modded MC. Once you have your POL world set up, edit the instance and add HermitSkies under the world option. HTH someone else! Trying to install Hermit Skies into MultiMC. I keep getting errors which says "archive does not contain a recognized modpack type." When I've tried using a Curse downloader, I get errors saying that several core mods aren't recognized. I'm able to get Project Ozone Lite to import, but not HermitSkies. Help? Edit: SO I created a normal world just to see the file in the Saves folder....and it's empty. Where do the worlds get saved? Problem: I'm playing single player, I extracted the file to my saves folder and....there's nothing there when I go to play it. I am probably doing something obviously wrong, can anyone tell me what it is? Thanks! Yeah, I don't know how either. Is there a tutorial to download the map or anything? The issue is with the world being in peaceful mode. I had to change my world with NBTexplorer to enable change, change the daylight settingss, change the difficulty, and enable commands. did you didnt try /difficulty hard ?? Is there a way to make sure the Starting island and only that will not spawn mobs?